I did this painting as a demo for my Austin mentor group. I also took a set of photos to show a step by step painting process. Those photos will be published with an article on one of the main steam art magazines. Since it is still early, I don't have enough information. I will let you know when I have the publishing date and where you can get this magazine. It was fun painting this antique porcelain pot. By the way, my blog gadget for signing up for my painting emails seems working now. Today is a very special day to our family. Our son Jonathan has started his college life. Song and I know that we will be empty nesters, but we didn't realize it comes so soon. Jonathan is only 16. He has enrolled into a special high school program called "TAMS" (Texas Academy of Science and Mathematics) run by the University of Northern Texas. Although he is still a high school student, but all the courses he will take will be college level offered by university professors. We drove 4 hours to Denton, TX, and got him moved in. Our baby boy now has left home. It is a very special kind of feeling in my heart. I still remember the day I left my parents. My father removed his watch and gave it to me. I suddenly realized that I was no longer a kid any more. At that time, watches were expensive and they were only for adults. I left home, and moved far far away. I hope Jonathan will come home more often, no matter where he goes. My today's painting is from a photo I took in San Francisco last July. A group of young AAU students were waiting for the school bus to come. I hope some of the AAU folks can see this image. They will relate to the scene immediately. It happens every morning of a regular school days. I remember I was so concentrated taking pictures. After I got the one I felt satisfied, I suddenly found out, the bus I supposed to take had long gone. It has been a year since I stayed in San Francisco attending AAU. That time my dorm was in downtown near the Union Squire, but the Painting studio was near the Fisherman's Wharf. Most of the time I rode the school bus commuting from one place to another, but occasionally, I travel by MUNI (the public transportation in SF). I specifically like the trolly. The old fashion one is the best. This painting is reminiscing my good time there last summer. I really enjoyed painting it. Many artist friends subscribe my painting emails. It has been working pretty well since I established this function when I started my blog in 2007. I was using "Google Groups" to store my email list. However recently, Google has "upgraded" the "Google Groups", but my gadget for subscription on my blog can not work anymore. I tried to fix the problem, but I can't find any solutions online, and I can't find any tech support from Google. So I give up. If you are currently receiving my painting emails, there is no change for you, you will still receive my email as usual. If you currently are not on my mailing list and want to sign up. I have just started a new group using the "Feedburner". You will receive my painting images and my writing synced with my blog, but the format may look different from my "Google Groups" emails. If some of you are savvy about "Google Groups", please help me. I wish life can be simpler, and I just want to paint. Sigh!!!!! I painted this painting this morning with a group of artists I am mentoring in Austin. One of students is passionately in love with Ikebana (Japanese flower arranging). She brought a set of special ikebana items for our today's project. I put this small Japanese doll in the setup to create the center of focus. This class was full of laughters. You may have the similar experience: if you are not portrait painter, the face you paint would highly possible to look like yourself. That was exactly happened today. All the dolls my students painted were cute self portraits of themselves. We all had so much fun today. Can anybody tell me why this happens? This is another large painting on a small painting surface. My experiments have gained more momentum. I have spent quite a few significant hours on it. It is a gallery level painting, but I want to see if I can market it myself. The price is different from the most of my daily studies, but I guarantee it has a high quality. The scene was from a photo I took in Kinston, NC. I was invited by a group of workshop artists for a dinner in a very good restaurant. The food was so delicious. Moreover, we sat by a window to the kitchen. I snapped many photos of the chefs working there. In current representational art world, one of the master artists I really admire is Quang Ho. It happened several times in the past, some artists mistakenly thought I am Quang. I was flattered every time when this happened because I knew Quang and I are not in the same level. When I just joined OPA, Quang is already the judge of OPA National Shows. I really like Quang's painting of kitchen scenes. Before I paint this one, I looked and studied Quang's paintings. They helped me significantly. This is a large painting, 30" x 40". I spent a week to do it. No, I am just kidding. This one is only 5" x 7". I did this one to see if I can paint a super busy scene on a very small surface. The reference photo was shot in HongKong last December. It was very busy street, full of people, cars, and junks whoever knows. It challenges me to see if I can make a painting out of it. If you paint plein air, you must have been into similar situation. In front of your eyes, there is so much going on. You are wondering how is possible to make a painting out of this mess. My approach to simplify the scene is closing one eye and squint really really hard the other eye, then you get the basic light pattern. Use this basic pattern to generate your composition, and make sure the perspective is correct. After you get this, latter stages are much easier. Now is my experiment time again. This is a small study I did from a photo I took in China. It is a small village called Tong-Li. 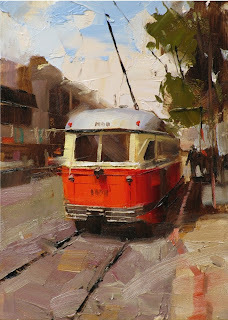 Based on my previous research on grays, palette knife work, and investigation on Tibor Nagy's painting style, I am trying to figure out a procedure I can apply quickly on my plein air activities. This small painting hardly have any colors. It is predominately a value design. Landscape painting has much more freedom compared with still life paintings. There are so many abstract shapes in this painting. However, obtaining this freedom is not easy. I have spent two days on this 5" x 7". This is my flower demo at Granbury. You may see the composition of this painting is almost the same as the one I did at Landgrove, Vermont. I like that painting so much, so I want to make sure that getting that painting was not an accident. That is the the reason I did a similar setup. The painting turned out good. I feel satisfied. The high light on the silver pot was blindly bright. I surely enjoyed painting this one. Now I am back to Austin. I will rest a little and prepare my painting trip in China. I'd like to set up one major milestone for every year. For 2010, I met Richard Schmid. For 2011, I quit my engineering job. For 2012, I attended AAU studying figurative with Zhaoming Wu. Now for 2013, I will lead a group of artists painting in China. I am grateful for all these opportunities, and humbled in front of all challenges. I really appreciate all of you for encouraging me on this very special journey. Thanks. “Demo at Granbury 2013 2"
I used my second demo as a step-by-step guidance. So I selected relatively simple objects. I added leaves at the last moment using knife work to enhance the composition. The subtle colors and rich grays make the painting calm and tranquil. This is the first demo at the Granbury workshop. I specifically like the mysteries of this one. I did not use much of high chroma colors this time. The abstract patterns on the copper and the brush work to the left of the copper are the parts I like the most. The transition from the abstract shapes on the left to the realistic presentation on the right is cohesive and smooth. Due to my massive amount of traveling and teaching, my demo paintings have become a significant part of my daily painting practice and blog posts. Different from my personal study and exploration, demos have shown certain amount of repeatability. If you feel you see too many of the same thing, please let me know. Arrived at Austin around 1:00 AM. I had a few hours sleep, then jumped into my car. Driving about 4 hours, I have arrived at Granbury Texas. The local temperature is 104 F. Granbury is about 40 miles south of Ft. Worth. It is a typical Texas town. This is the city hall of Granbury. I want to thank the Lake Granbury Art Association for organizing this workshop, and thank all the artists for attending. We are having wonderful time here. "Demo at Landgrove 2013 3"
For every workshop, I must painting some flowers. So this is my third demo at Landgrove Vermont. In addition, I really enjoyed painting the silver kettle in this one too. Now the workshop is over. I want thank all the artists for coming and learning. I really enjoyed meeting all of you and hope to see you again in the future. Yesterday was a relaxing day for me. So I decided to take a walk. Vermont is a very quiet place. The entire population of Landgrove is just a little more than 100 people. I was walking on the dirt road and enjoying the nature around me. I didn't see anybody around, except the spirits who had passed before my grandfather was born (I passed two very old cemeteries, I didn't see any ghosts but imagined). Well, I thought I was the only alive soul on the winding dirt road, but a car is approaching me and stopped right in front me. A gentle man came out of the car and said to me: "You must be Chong Wong." I was stunned with surprise. It turned out he was one of the artists from New Hampshire who took my workshop at Putney a few months ago. He was plein air painting in this beautiful Vermont country. Wow! the world is so vast, and so small as well. "Demo at Landgrove 2013 2"
Now this is the second demo. I guided the students by dividing my painting process into several stages. Everybody has been enjoy this approach. I have seen noticeable progress on students work. We all very happy about this workshop. I usually do my demos with the objects I am familiar with. However when I saw this old scale in the dining room of the Landgrove Inn, I just simply can not resist the temptation of painting it. The composition of this painting might not be ideal for a powerful design, but I have really enjoyed painting the scale. I have been to Vermont quite a few times, Almost all my previous visits were at Putney and painted with Richard Schmid. Well this time is a little different. Now I stay at the Landgrove Inn right in the middle of the Green Mountains. People are coming from all over to be away temporarily from busy city life and to be near the nature for a while. Landgrove Inn offer many art workshops all year around. I want thank Thomas Checchia for the opportunity of teaching here. There are so many country scenes all around here. 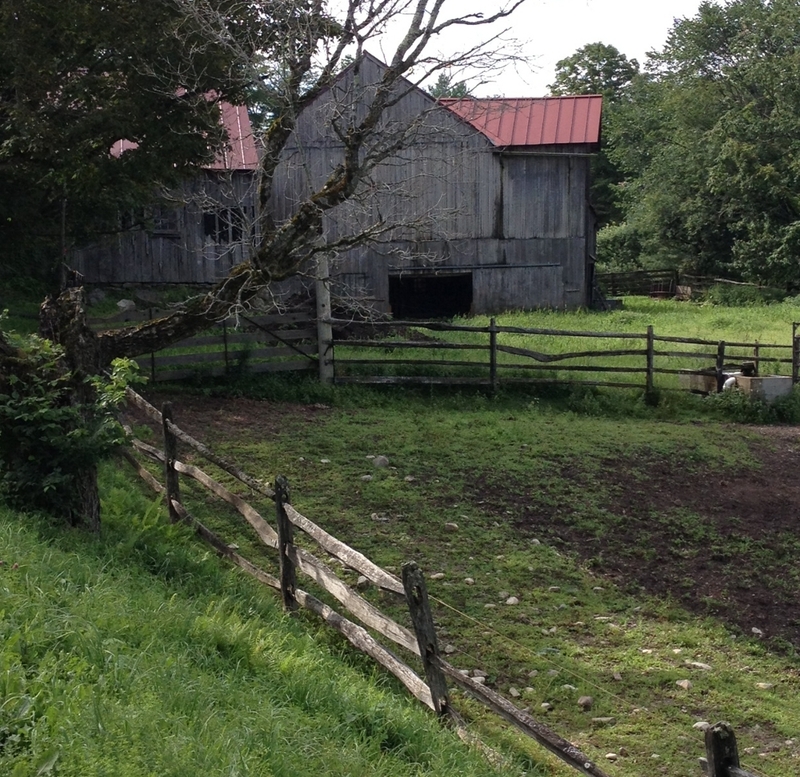 This is a photo I shot this morning of a rustic barn right outside the Inn.